David Hoflin ... Harold Fingleton Jr.
Kain O'Keeffe ... Young Harold Jr.
Dora Fingleton: [about Tony, proudly] Your son's just won the junior championship. Harold Fingleton: [to John] Wait'll these mugs see what you can do. Since all the reviews I read on this film so far are from Australia, I couldn`t resist to comment on it, if just for showing that it made the other side of the world :-). I bought the DVD because I already am a fan of Jesse Spencer (though I never had the chance to see his "Neighbour"-appearances) - I like him in "Stranded". 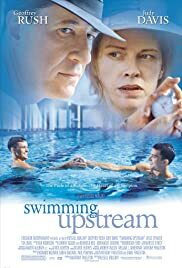 So I bought the DVD of "Swimming upstream" and was really impressed by his acting-skills. The story lacks a little tempo at times, but the characters played by Jesse Spencer and Judy Davis are really coming to life very well. And the way I dislike Geoffrey Rush`s character is proof of his good job either. Contrary to a previous review I read, I liked the use of the editing machine during the swimming sequences just fine. The only thing that struck me was the music during those sequences, that just was dramatic all right, but way to modern for the time that movie played in. With a little more tempo this might have been a top-league drama, but it still deserves to be better known and I will certainly recommend it to friends of drama-movies. I hope for Jesse Spencer to find more roles that bring out his talent and make him even better known worldwide. It`s not often that good looks and talent go together (Kevin Zegers is another fine actor that deserves to be better known...). I still wonder, why Tony`s father disliked his own son that much...I wish no kid would have to live through something like that. Ever!